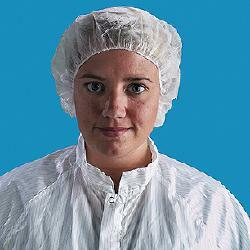 CleanroomSupply offers both regular and laminated polypropylene bouffant caps. Both types are colored white and are constructed of latex-free, non-woven polypropylene materials. These practical bouffant caps are lightweight, breathable, and feature a comfortable floss covered band to keep them in place. Three different cap sizes are available: 21", 24", or 28". The regular bouffant caps come packaged 100/bag and 10 bags/case. The laminated bouffants are packaged with 250 caps per case.